Target GiftCards® let you shop for thousands of items at more than 1,700 Target and SuperTarget® stores, as well as online at Target.com. To redeem a Target eGiftCard in stores, simply show the barcode on your web-enabled mobile phone (Target stores cannot accept a printed copy of a Target eGiftCard at the register). Please note that data rates may apply. Now, you can even save Target GiftCards to your Internet-enabled mobile phone, just text GIFTCARD to 827438 (Target), or visit m.target.com/gc from your phone. Standard message and data rates may apply. 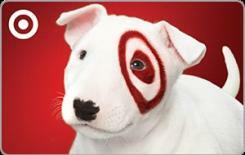 The Bullseye Design, Target and Target GiftCards® are registered trademarks of Target Brands, Inc. All rights reserved. Terms and conditions are applied to GiftCards. Target is not a participating partner in or sponsor of this offer. *You must have an internet-enabled mobile phone to use this eGiftCard® at a Target store.